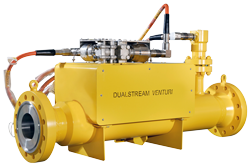 Dualstream Venturi is a low CAPEX solution for allocation or monitoring of gas flow rate. It is typically used on a per well basis. Installed either in the Xmas tree, removable choke bridge, jumper or manifold, it is ideal for high GVF applications. By only deploying standard sensor systems subsea, all flow computation is carried out topside, ensuring minimum intervention during the life of the field topside. Common applications include tie-ins to existing infrastructure or large multi-well fields where production fluids remain relatively constant throughout field life. Compact flowmeter design options are available for applications where installation envelope is restricted, please contact SolartronISA for details.